There are 150 historic hospital campuses operated by the Department of Veterans Affairs today, but many are threatened with closure, replacement with a “shiny, new” facility, or demolition of signature historic buildings. A new report from the National Trust offers recommendations for saving these campuses and buildings, and today’s toolkit boils it down to tips and examples you can use in your community. 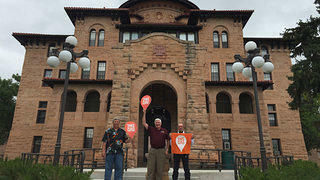 Veterans show why This Place Matters to them at Battle Mountain Sanitarium Administration Building. 1. Understand the needs of veterans. Find out what the VA and veterans in your community want from a facility. More or less space? Different uses? Make the case that buildings that might no longer be suitable for one use are a great fit for a different, new use, including by outside groups. 2. Make the case for the buildings. Historic buildings come with loads of great attributes, such as high ceilings, natural light, landscapes that offer recreation and respite, and transit-friendly locations close to other services. 3. Tell the story. Collect oral histories from veterans and employees. Prepare an exhibit featuring historic and current campus images. Because many campuses were popular tourist destinations, there are often great historic postcard images to share. 4. Let the community in. Develop and lead a campus tour (featuring “behind the scenes” locations that people have always wondered about but never seen) or participate in a local “Doors Open” community event. 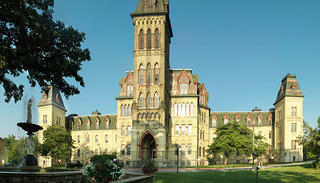 Follow the heritage travel itinerary for the National Soldiers Homes developed by the VA and the National Park Service. 5. Organize a “save it” campaign. Successful campaigns are most effective when they start early; are broad-based and community-driven; and engage a wide variety of veterans, citizens, businesses, nonprofits, and government entities. The case studies below include many great examples. 6. Arm yourself with information. Our new report, Honoring Our Veterans: Saving Their Places of Health Care and Healing, includes background on the VA, information on how they make decisions about historic properties, and case studies to model in your community. 7. Battle Mountain Sanitarium (Hot Springs, S.D. ): One of our National Treasures, this National Historic Landmark is threatened with abandonment and closure. The Department of Veterans Affairs wants to shutter it after over 100 years of service to veterans and construct a new facility 60 miles away. 8. Milwaukee VA Soldiers Home (Milwaukee, Wis.): Since 1867, this National Treasure has provided care to veterans throughout the region. Though many of the Soldiers Home buildings remain in use, three of the largest and most visible -- Old Main, Ward Memorial Hall, and Home Chapel -- are currently unoccupied and could be lost unless they are restored to support veterans’ needs. 9. Dwight D. Eisenhower VA Medical Center (Leavenworth, Kan.): In the early 2000s, the VA planned to demolish 39 historic buildings on the National Historic Landmark campus to expand the cemetery. Instead, those buildings were leased to a developer who is rehabilitating them for housing and offices in support of the VA’s mission. 10. Canandaigua Medical Center ( Canandaigua, N.Y.): In 2003, the VA proposed to close this 1930s campus and relocate services to other facilities. The community organized in opposition to the closure and, 10 years later, Canandaigua continues to operate and new VA services have been added.